I really do like that “Use” tab. I think I will, uh, use it quite a bit. Searching for a given word in all of Scripture in any language without clicking or typing? Excellent! The high-res images of Sinaiticus—tagged with little indications of where each verse starts—are very cool! I could have used this in NT Textual Criticism in seminary. I wonder how much use I’ll get in day-to-day exegesis… But as a teaching tool in a classroom this can’t be beat. 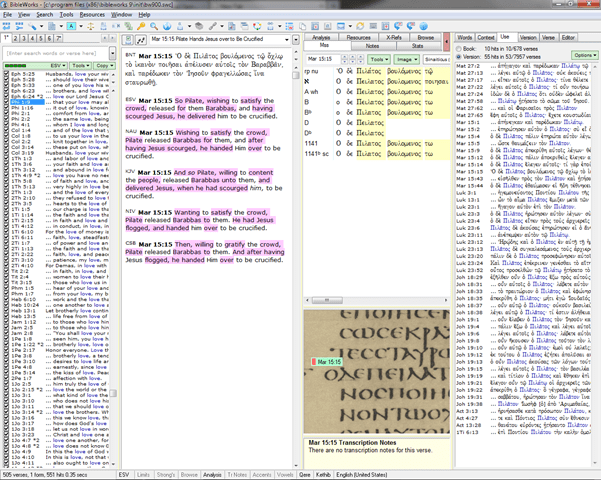 I will, however, use the automatic collations generated in the Mss tab. A computer makes a compact apparatus with a million abbreviations unnecessary (at least when you’re on a computer!). I do think this feature could be designed a little better aesthetically, but it’s still quite useful. Automatic difference highlighting is pretty nice (the older text comparison tool is still available), though I doubt I’ll leave it on considering that some verses become a sea of pink except for the words and and the. Note that pressing “e” while the browse window is active toggles this feature..
You can choose “Small Toolbar” under the “View” tab. Do so. Buy yourself a few more pixels of screen space for verses and searches. Barry Beitzel’s Moody Atlas of the Bible does look genuinely useful in a BibleWorks context. I’ve never used the map module much, but I think I very well may use this regularly. I like it that the Three Forms of Unity are a menu option. It reminds me that BibleWorks is unapologetically conservative theologically, that it is a tool created by lovers of the Word for their own kind. Make sure to spend some time checking out ERMIE, the External Resource Manager. You will find some sites you’ve never been to, guaranteed. There are some depths to this program that I’ll have to search out. Apparently I can do my own textual criticism and even morphological tagging. I guess that means tagging MSS no one has gotten to yet? I don’t yet get all the ins and outs of the text crit resources. These are initial impressions—remember? I wish my wife packed BibleWorks for me in my lunch.